Last year I caught wind of this super cool 1940’s hangar dance that happens every year at our local Aviation Museum for Valentine’s Day. Think big band, tons of vets, surrounded by actual jets used in WWII, taking place in an actual airplane hangar…and everyone is dressed in 1940’s attire. OBVIOUSLY I MUST ATTEND THIS EVENT!!! This is a sponsored post written by me on behalf of Fiskars®. All instructions, photos, and opinions are 100% my own. Thank you! 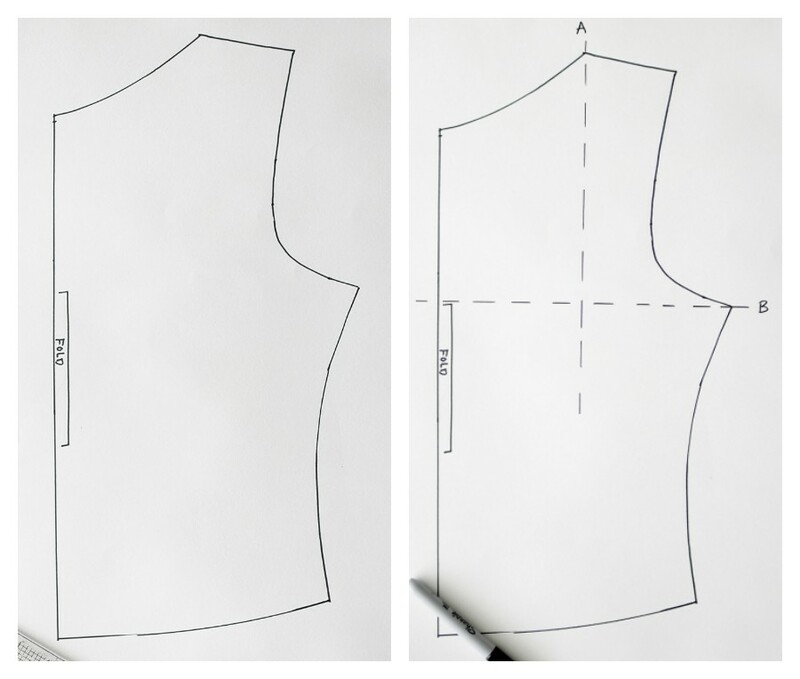 Step One – Use a basic knit bodice sloper (or trace around a nice fitting shirt that you like). You want it to have a high neck, so alter as needed to accommodate. We are going to alter the FRONT bodice pattern. 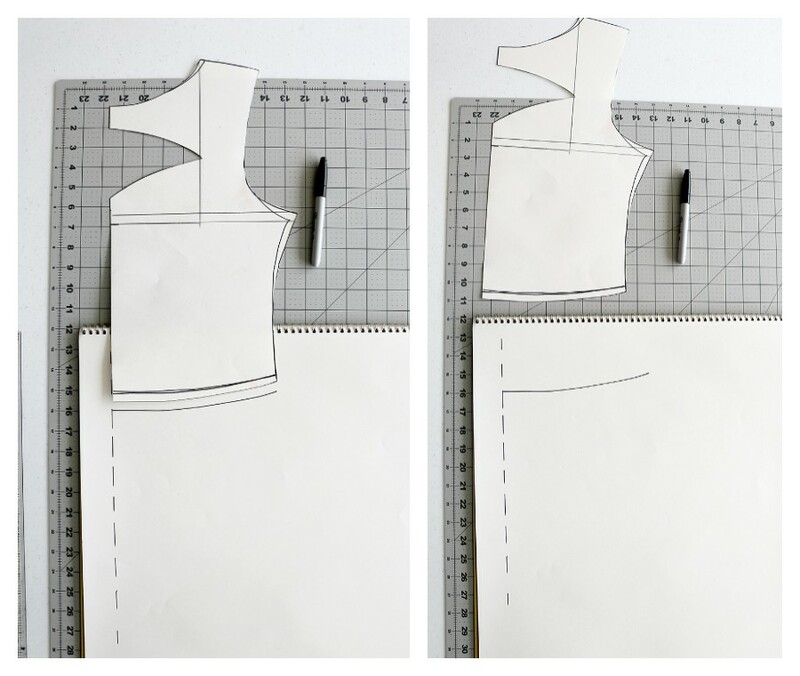 Using a ruler, draw a straight line from the front shoulder towards the hem. Let’s call this line ‘A’ (see above photo). Next, draw a line from the bottom of the armsyce towards the front center. Label this line ‘B’. Using your curved ruler, draw a curved line from point C to D.
Step Three – Next, draw another curved line from point D to E. This will be your keyhole opening. Lastly, and this is optional, I wanted a nice high waist on this dress – something that would hit at my actual waist. So I chopped off the bottom of my normal bodice, taking a good 2″ off. 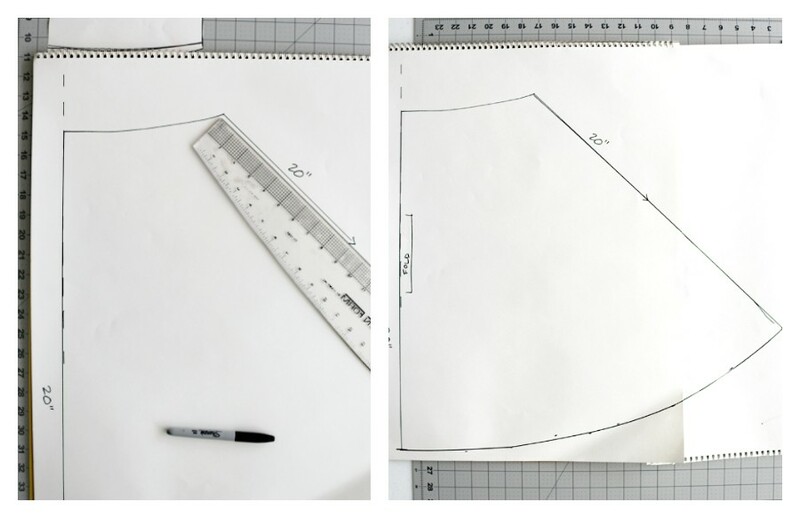 Step Four – To draft the actual skater skirt, I lined up the bottom of my new front bodice on top of a piece of paper and traced the curved bottom hem. Then I drew a straight line down the front center of my skirt to correspond with my front center bodice. 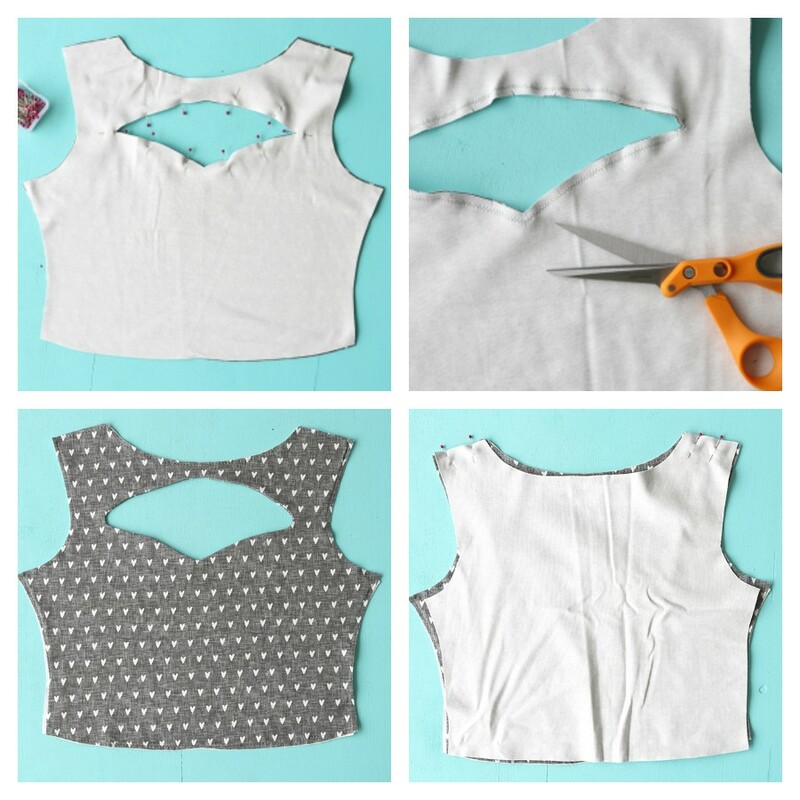 *As mentioned previously, if you do not already have a bodice sloper I recommend cutting around a t-shirt you already own to get the right pattern pieces. I also highly recommend sewing a muslin first, as dresses require a lot of fabric to make – and you want to ensure the proper fit first before you cut into your nice material! 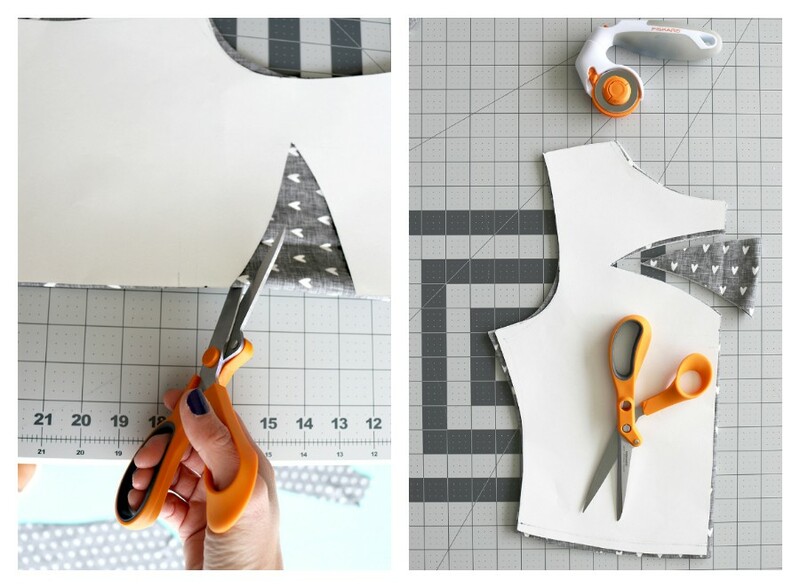 When cutting out most pattern pieces, I love to use my Fiskars® adjustable 3 position blade rotary cutter. You can find my product review HERE. It is a fabulous rotary cutter that cuts through multiple layers of thick fabric at once, while the blade handle allows you to apply just the right amount of pressure every time. But when you need to cut out smaller openings, or be specific with your cutting, then always stick to the classic Fiskars® orange handle scissors. Did you know Fiskars is celebrating their 50th anniversary this year?! That is 50 years that we have been relying on their orange handle for all of our sewing needs. I don’t know about you, but that iconic orange handle has been a constant in my sewing studio since the day I bought my first yard of fabric! Their new Amplify® RazorEdge™ Serrated Fabric Shears, which you can see me using in these photos, are fabulous because the serrated edge allows you to cut through slippery fabrics without the fabric slipping when you are cutting! The serrated edge grips the fabric, holding it in place, while you are cutting! 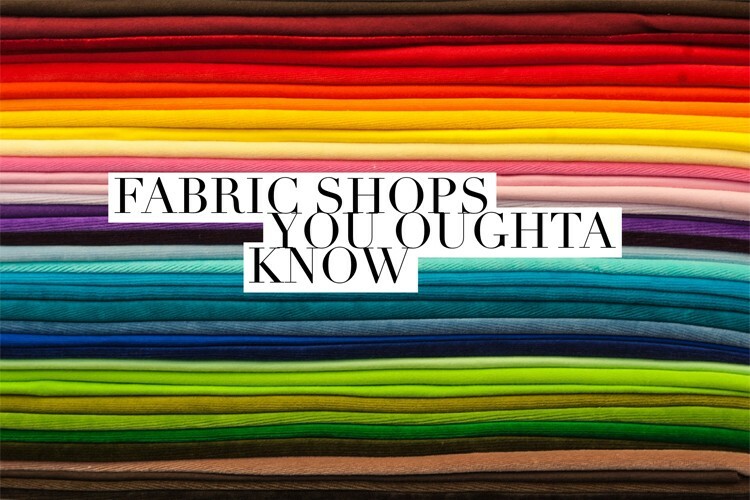 Giving you the perfect fabric cut, every time. 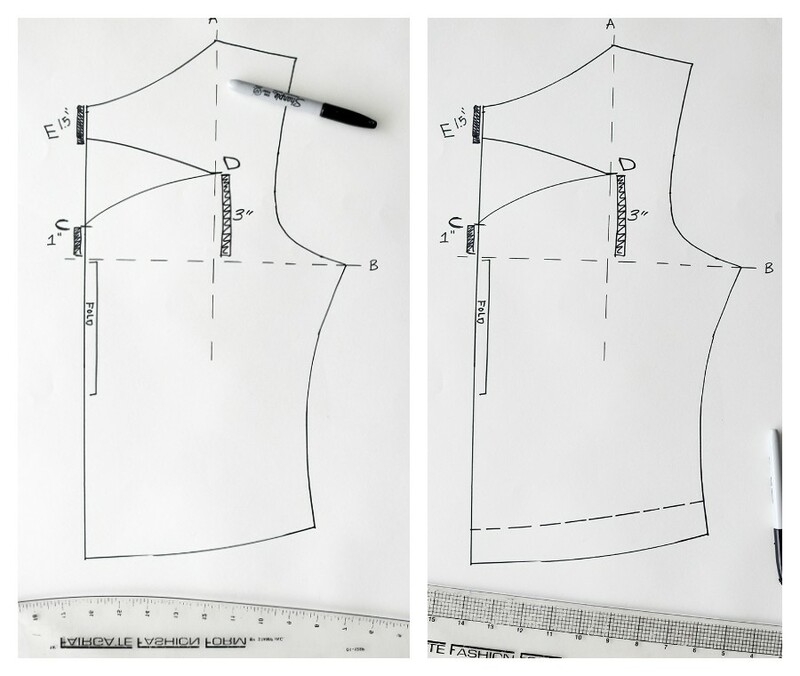 Step One – Place the 2 front bodice patterns right sides together, matching up all side seams. Pin the keyhole opening, and sew around using a 1/4″ seam allowance. Step Two – Clip the seam allowance curves, really clipping the sides well to make sure your fabric doesn’t pull funny. Step Three – Turn right side out and press. Baste stitch around the entire outer edge of your front bodice, using a 1/8″ seam allowance, to keep fabric in place. Step Four – Place front and back bodice right sides together, pin and sew shoulder seams. Press seam open. 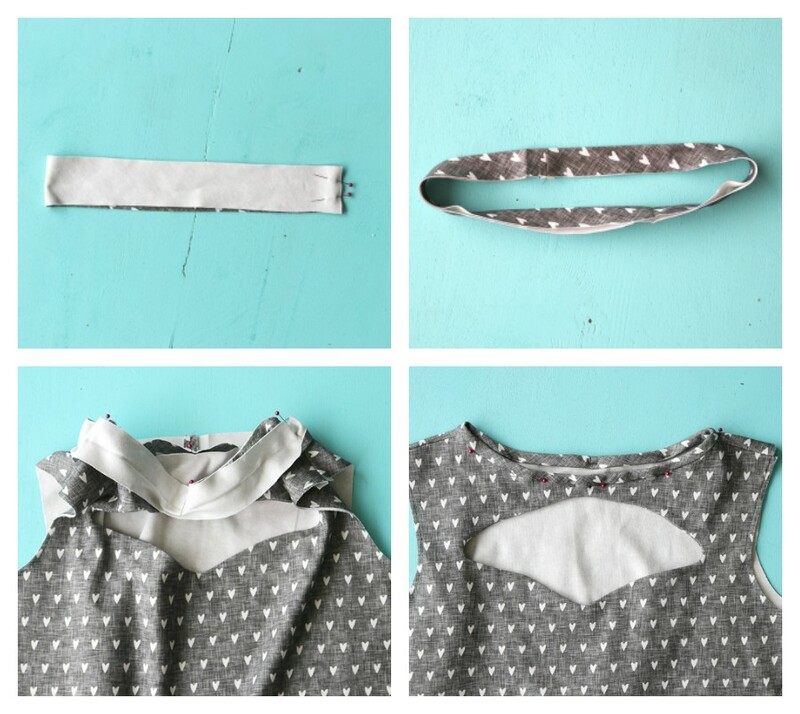 Step Five – Fold your neckband in half, right sides together, matching up the short outer edges. Pin and sew. Press seam open. *If you need to draft a neckband, use a measuring tape and measure around your neckline. Subtract 2 – 3″ from that measurement, and cut (1) neckband that measurement x 2″ wide. I tend to cut mine on the bias for extra stretch. Step Six – Fold neckband in half, wrong sides together, matching up the outer edges. Step Seven – Unfold the neckband, and pin around your neckline, stretching the neckband as you pin so that the neckband is the same width as your bodice neckline. Sew using a 3/8″ seam allowance, and a nice stretch stitch such as a zigzag stitch, serger, or stretch stitch if your machine has one. Clip seam allowance. Step Eight – Fold the upper edge of the neckband 3/8″ towards the wrong side, and again where the middle fold line is on the neckband. Pin the bottom of the neckband in place, just under the neckband seam. Sew using a long straight stitch to secure. Step Nine – Match the center curve of the sleeve with the shoulder seam and pin right sides together. Continue pinning the sleeve curve to the armsyce on both sides. Sew and clip seams. Repeat for other sleeve. 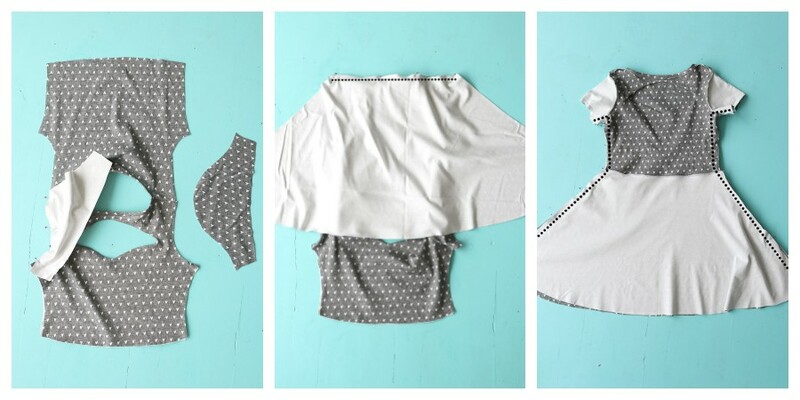 Step Ten – Pin the upper skirt seam to the bottom bodice and sew using a stretch stitch, zigzag stitch or serger. Press seam up. Repeat for other skirt and other bodice. Step Eleven – Fold dress right sides together matching up all side seams. Pin and sew. Step Twelve – Fold sleeve hem 1/2″ towards the wrong side and press. 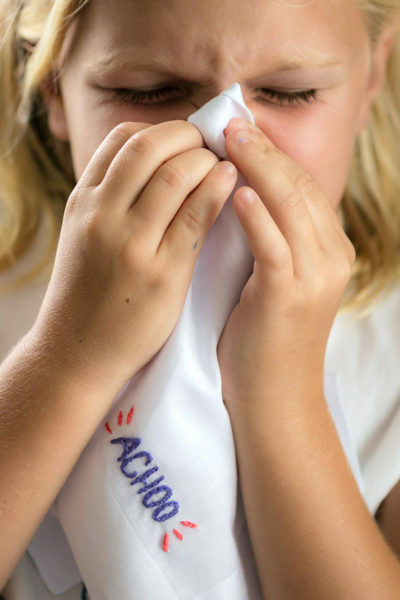 Pin and sew around using a long straight stitch. 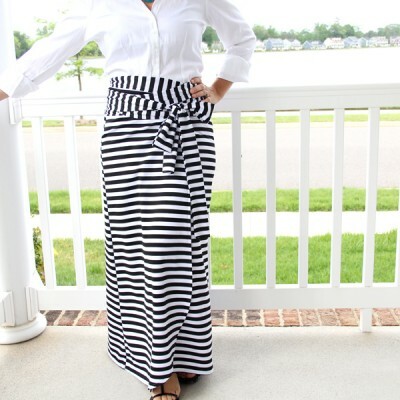 Repeat for skirt hem. BOOM!!! Look at those muscles!! Those muscles hand sewed this awesome dress, yes m’aam!! Woot woot! Stay tuned for later in the week when I show you how to style your hair with this awesome victory roll hairstyle. I know I don’t normally do hairstyle tutorials, but why not. Am I right? This hairstyle is totally cool, and looks fabulous with this dress! So if you make it far enough to sew this dress, you should totally take the extra 15 minutes to style your hair appropriately to go with it. 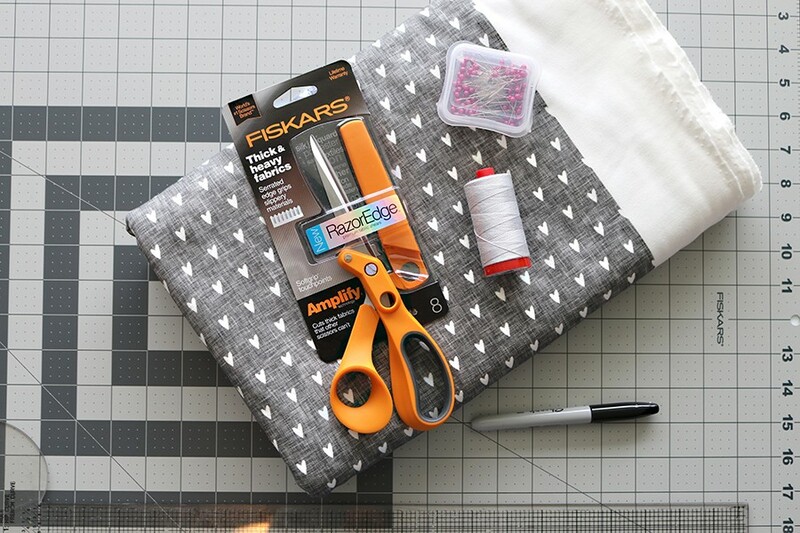 A special thanks to Fiskars® for sponsoring this post, believing in my work, and honoring those moving the sewing craft forward in these modern times. Fiskars® orange handled scissors are the iconic fabric scissors that we have come to trust and rely on for all of our sewing needs these past 50 years and counting! I am humbled and thankful to work with them. So give a shout if you love Fiskars® as much as I do, and are territorial over your fabric scissors! Nobody better touch paper with my fabric scissors…lol. How to sew a vintage 1940s inspired keyhole dress. STEP ONE – DRAFTING THE PATTERN. Use a basic knit bodice sloper (or tracing around a nice fitting shirt that you like). You want it to have a high neck, so alter as needed to accommodate. We are going to alter the FRONT bodice pattern. 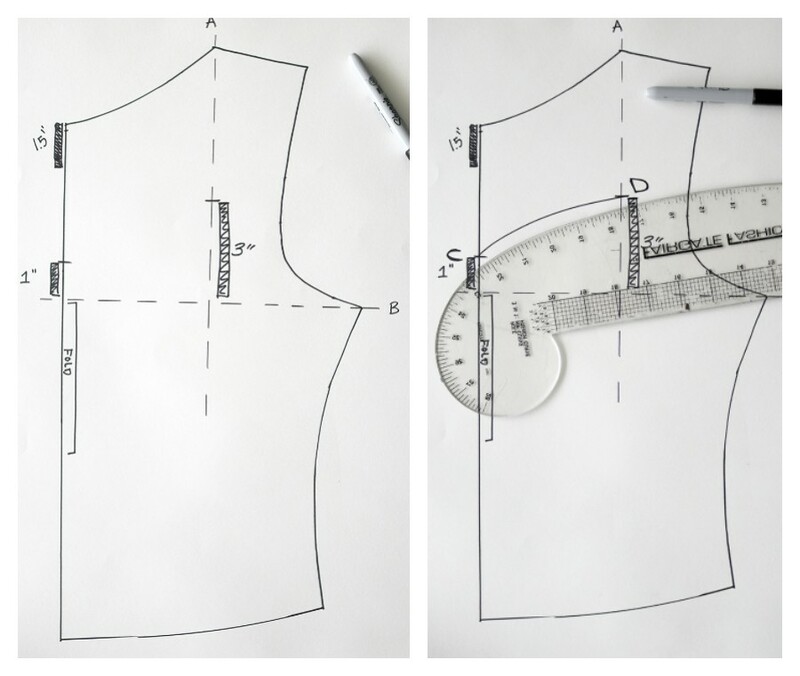 Using a ruler, draw a straight line from the front shoulder towards the hem. Let’s call this line ‘A’. Next, draw a line from the bottom of the armsyce towards the front center. Label this line ‘B’. Make the following measurement markings: 1″ up from Line B on the front center of your bodice (‘C’), 1.5″ down from the front center neckline (‘E’), 3″ up from where line A & B intersect (‘D’), using your curved ruler, draw a curved line from point C to D.
Next, draw another curved line from point D to E. This will be your keyhole opening. To draft the actual skater skirt, I lined up the bottom of my new front bodice on top of a piece of paper and traced the curved bottom hem. Then I drew a straight line down the front center of my skirt to correspond with my front center bodice. STEP TWO: CUTTING OUT THE PATTERN PIECES. You will need the following pattern pieces: 2 Bodice front, 1 bodice back, 1 neckband, 2 sleeves, 2 skirt pattern. 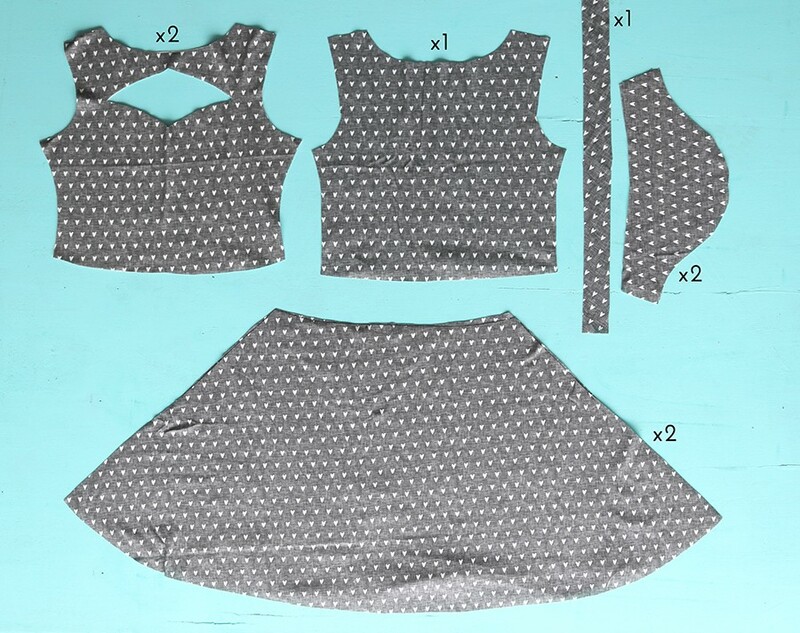 *As mentioned previously, if you do not already have a bodice sloper I recommend cutting around a t-shirt you already own to get the right pattern pieces. I also highly recommend sewing a muslin first, as dresses require a lot of fabric to make – and you want to ensure the proper fit first before you cut into your nice material! STEP THREE: SEWING THE KEYHOLE DRESS. Place the 2 front bodice patterns right sides together, matching up all side seams. Pin the keyhole opening, and sew around using a 1/4″ seam allowance. Clip the seam allowance curves, really clipping the sides well to make sure your fabric doesn’t pull funny. Turn right side out and press. Baste stitch around the entire outer edge of your front bodice, using a 1/8″ seam allowance, to keep fabric in place. Place front and back bodice right sides together, pin and sew shoulder seams. Press seam open. Fold your neckband in half, right sides together, matching up the short outer edges. Pin and sew. Press seam open. *If you need to draft a neckband, use a measuring tape and measure around your neckline. Subtract 2 – 3″ from that measurement, and cut (1) neckband that measurement x 2″ wide. I tend to cut mine on the bias for extra stretch. Fold neckband in half, wrong sides together, matching up the outer edges. Unfold the neckband, and pin around your neckline, stretching the neckband as you pin so that the neckband is the same width as your bodice neckline. 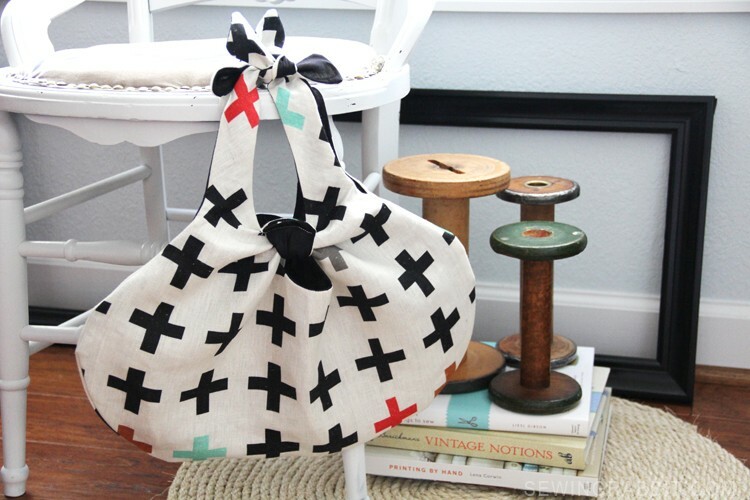 Sew using a 3/8″ seam allowance, and a nice stretch stitch such as a zigzag stitch, serger, or stretch stitch if your machine has one. Clip seam allowance. Fold the upper edge of the neckband 3/8″ towards the wrong side, and again where the middle fold line is on the neckband. Pin the bottom of the neckband in place, just under the neckband seam. Sew using a long straight stitch to secure. Match the center curve of the sleeve with the shoulder seam and pin right sides together. Continue pinning the sleeve curve to the armsyce on both sides. Sew and clip seams. Repeat for other sleeve. Pin the upper skirt seam to the bottom bodice and sew using a stretch stitch, zigzag stitch or serger. Press seam up. Repeat for other skirt and other bodice. Fold dress right sides together matching up all side seams. Pin and sew. Fold sleeve hem 1/2″ towards the wrong side and press. Pin and sew around using a long straight stitch. Repeat for skirt hem. You’re such a babe! What a gorgeous dress.